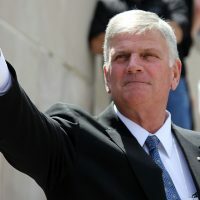 (Thomas D. Williams – Breitbart) Celebrated evangelical pastor Franklin Graham has urged Cardinal Timothy Dolan to take a strong moral stand against Governor Andrew Cuomo for his recent expansion of abortion in New York in the face of calls for the governor’s excommunication. The article cites Tennesee Bishop Rick Stika of Knoxville who said that if it were up to him, he would excommunicate Cuomo. “This vote is so hideous and vile that it warrants the act,” Bishop Stika wrote.